If your Mac isn't already connected automatically to the SFSWLAN wireless network, it may prompt you to join a wireless network once it is detected. If not, you can also select a WiFi network manually. 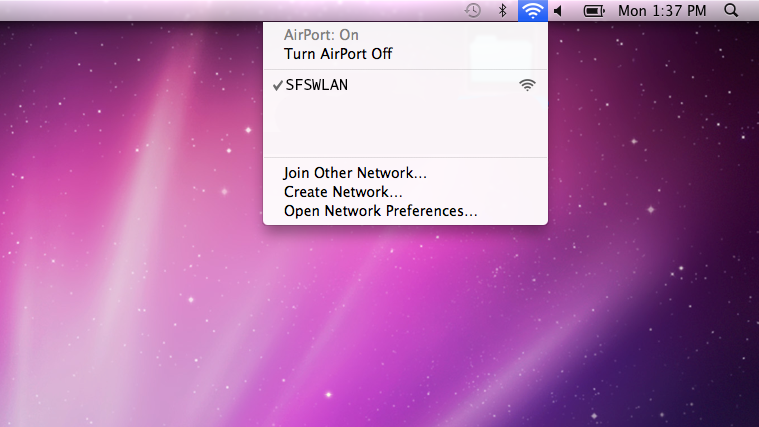 From the WiFi menu (AirPort menu), choose the SFSWLAN network. Once you are connected to the SFSWLAN network go into an internet browser and login into the system to be granted internet access at uac.sfs.or.kr if you are not automatically taken there as soon as you open the browser. *On some versions of Safari, uac.seoulforeign.org may come up in lieu of uac.sfs.or.kr.